My uploading / VPN woes continue. By this time tomorrow, I hope to be somewhere where I don't need to walk to an elevator lobby and stand with my laptop in order to upload a photo or send an email. Yes, I dream big. 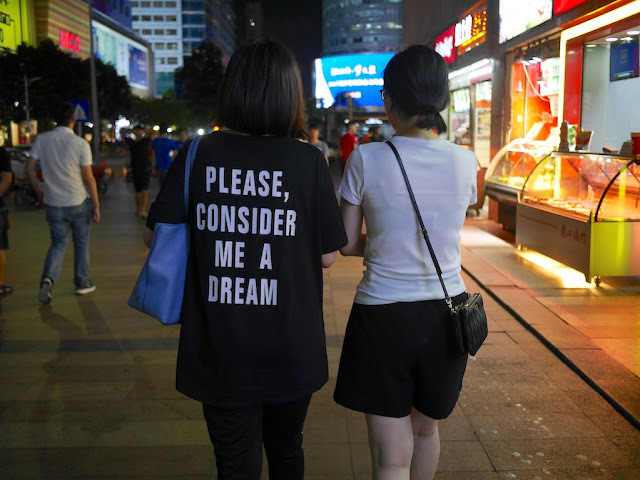 Since the previous two posts touching on this topic include photos of shirts I have seen in Shenzhen, I will continue that theme. Now, I might visit some sites that aren't blocked in China. Oddly enough, I'm finding that browsing online without using my VPN is unusually fast, including for unblocked U.S. sites. I don't think it's a dream. My take on this situation is that it's related to the recent news story about the counterfeit vaccines. According to Chinese political thinking, the best way to manage any negative news is to overreact by clamping down on the internet. Because that certainly makes the regime appear less incompetent. I was told to not expect VPN working again until Tuesday. Hey, progress! Tuesday? My sense was that my problems were due to very local issues because a) standing in the lobby for my floor reduced the problems and b) later moving to an entirely new location resolved all the unusual problems. All has been fine for me since Thursday.